I recently heard from a fellow named Richard Luzzi, who shared a wonderful story about meeting Timothy in El Monte in the late 1950’s. Just a few more details about when I met Tim. He must have just been finishing work on The World’s Greatest Sinner on the El Monte Mall on the corner of Lexington and Valley. I walked up to him and had no real angst because I was a young Arroyo High School student. “Hi,” I said, “my name is Richie and I am a fan!” I asked him what he thought of Dan Terranova whom he had recently worked with in Rumble On The Docks. Danny was a school chum of my older brother Angelo. We all hailed from Jersey City. I was as a kid thrilled that Danny had great success in The Blackboard Jungle; then meeting Tim was almost too much. He said Danny was cool. We shook hands and he gave me a weak, fish-like grasp; I was surprised because he was so big and powerful. I was reminded the other day that he probably didn’t want to hurt me as I was barely 5ft 2, a small-framed Italian kid. He cut our little visit short and with a big tight-lipped smile he said “Goodbye Richieeeeeeeeeee!” in that long drawn-out way he’s famous for. A gentle giant who was kind and gentle to a little kid. Thanks Tim for our moment or two together. I noticed a still photo for The World’s Greatest Sinner had Tim in front of The Pit Barbecue on Garvey Blvd. in South El Monte. What a great place. My whole family and friends ate there all the time. Great prices and a 5 cent cup of coffee. I’m sure Tim ate there as well. 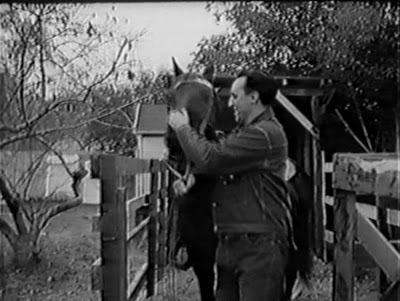 El Monte was a great little town and I know Tim loved it because he could be close to his horses. He must have lived in No. El Monte near the border of Arcadia where the wash or pretty sizable river bed separated the two cities. There were a lot of families living in the area with horses, at the end of La Medera St. off of Peck Rd. Paths Of Glory was the best anti-war film made till that time. It is my favorite work of his. Rest in peace brother, ’cause you gave it your all while you were here. This entry was posted in Film, Quotes and tagged arroyo high school, dan terranova, el monte, jersey city, paths of glory, richard luzzi, rumble on the docks, the blackboard jungle, the world's greatest sinner, timothy carey. Bookmark the permalink. Im Dan Terranovas Nephew Frank.If this person would like to know about my uncle Dan You can have them contact me.He was my uncle,an inspiration to the way I live and a great guy to be with . Frank, I certainly will! Thank you so much! This is so great to hear. Thanks again!